These full colour tea towels are certainly eye-catching! There are no limits on the number of colours with these tea towels, so children can be creative with their drawings. Felt tip pens give fantastic results, as well as bold pencil crayons. For younger children, handprints can work well as an alternative to portraits. We print your logo in full colour too and we also have a choice of colourful borders. There’s everything from summer Strawberries to Rainbow Stars to compliment your design! Our range of borders are perfect for lots of different occasions and fundraising events. The Confetti Dots border is ideal for celebrations, whilst our Wooden Picture Frame border or School Days border are brilliant for the end of term. An Art Pack - I am ready to go ahead! To make the process as easy as possible, we send a separate small paper template for each child to draw on. In this space, they can also write their name or initials too. 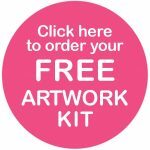 We include step-by-step instructions for you as well as a Freepost return label to send your finished drawings back to us. Our artwork team will prepare your design and send an email proof for you to check and approve before we print your finished tea towels. 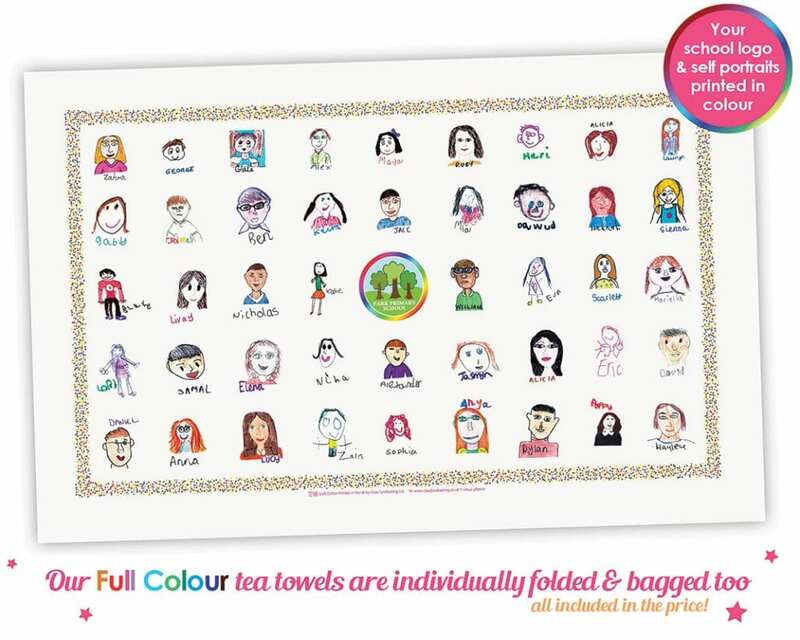 If you’re fundraising for a small nursery, playgroup or even an afterschool club, our Full Colour tea towels are ideal. There’s a low minimum order of just 25 per design, making them a perfect fundraiser for smaller groups. They’re popular too with guides, brownies, cubs and scouts. Don’t forget, these fabulous full colour tea towels are also individually folded and cello bagged, ready for you to hand out at school. This is all included in the price! If you’re looking for other ideas, why not try our fundraising mugs! They’re great for lots of different events and fundraising occasions, including Father’s Day, Easter, End of Term. Mugs are perfect as a leavers gift with the school logo, drawings or messages. Other fundraising ideas include Coasters, Mother’s Day Coaster Cards, Eco Bags, Aprons, Father’s Day Coaster Cards and our very popular Christmas Card project.